Looking to satisfy a sweet craving I opened our last remaining bottle of Virginia wine, the Hill Top Berry Farm & Winery Pounding Branch Persimmon Melomel. We had purchased the wine during a visit almost two years ago and stored away - forgetting the wine's profile. It's basically a 60-40 blend of honey wine and persimmon wine. Expecting a sweet honey wine, I was surprised to sip a dry wine and quickly swapped out the dessert vessel for a larger glass. Now I know why I purchased it. The wine has a nice fruit aroma and flavor up front and then a smooth dry honey finish. The honey remains basically from the mid-palette to the tail. Way to go Hill Top; I need to get back for more; although supplies are limited and depend on harvest of the persimmon crop on the mountain. I always look forward to finishing a rum bottle because it means another trip to the liquor store and a chance to browse the large selection of rums. 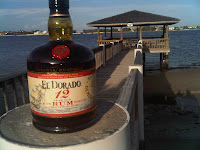 One that caught my eye was the El Dorado 12 Year Old distilled by Demerara Distillers Ltd in Georgetown, Guyana. Never had a Guyana made rum, probably because Demerara is that country's only rum distiller. 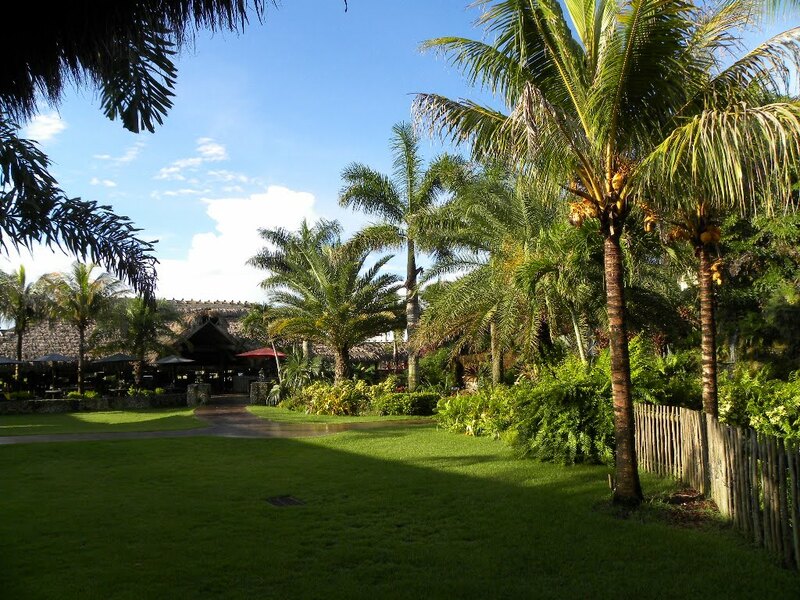 The sugar cane is grown on the fertile banks of the Demerara River and was the original source of sugar used in making Pusser's Rum. Since those early years "Demerara" rum was sourced in bulk to other distillers which had the unintended consequence of losing its brand. Demerara Distillers is attempting to rectify that situation by discontinuing the practice of selling bulk rum and instead bottle all their rum under the Demerara Rum name. And "today all rum bottled under the Demerara Rum name must come from Demerara Distillers in Guyana". Another fact that I found interesting is that this distiller operates the last remaining wooden still in the Caribbean. Demerara Distillers produces a wide range of rum products, but for our purposes we were only interested in their reserve line - the 12 and 15 year old rums. The 12-year old was priced with better value so it came home with us. It is a blend of selected aged rums, with the youngest being no less than 12 years old. The rum was distilled from one of three stills, including the double wooden pot still and then aged in used bourbon oak casks. The result is an incredibly smooth, smooth rum; I mean zero burn at the tail, with the finish lasting quite a while. I had to add a few drops of water to ignite the aromas which had more complexity than the flavor, which is sweet - almost like honey. In fact the rum was almost too sweet and mellow. I just didn't pick up many spice or fruit characteristics as my mind concentrates on its smoothness. That doesn't mean its not a good rum; it is extremely drinkable and affordable at $20. This is a good alternative to Ron Zacapa. The only local craft beers we can regularly find are those produced by the Florida Brewing Company, the state's largest craft brewer. The brewery reached that status through acquisition, by purchasing the assets of the Ybor City Brewing Company. 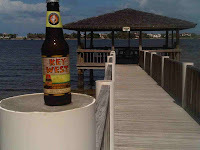 These assets included Key West (Key West Brewery, originally of Key West, Florida), Ybor Gold (Ybor City Brewing Company originally of Tampa, Florida) and Hurricane Reef (Hurricane Reef Brewery originally of Miami, Florida). These brands, as well as several others, are crafted at the company's Melbourne brewery. In the past I have sampled these brands, but its been a long time. I do remember enjoying the Ybor City products while visiting Tampa. 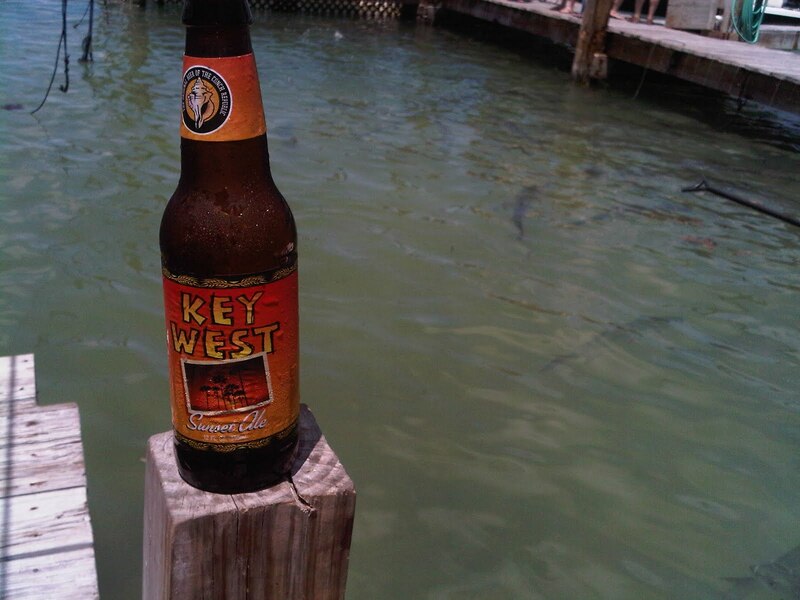 During this trip, it appears that the Key West brands were the most accessible. 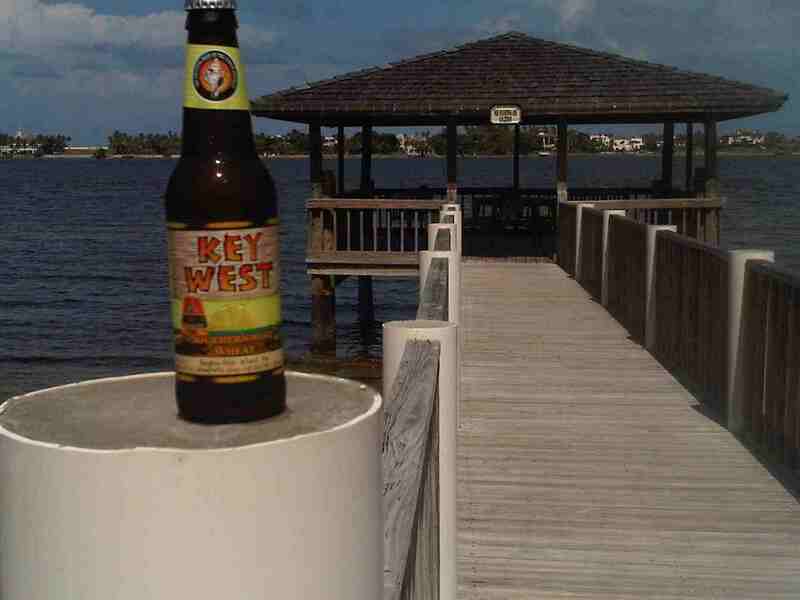 In the Keys I drank the Key West Sunset Ale which is available in many restaurants and tiki bars. Its a red amber ale and its not bad - I think it may just be too malty for the Florida environment. Instead I really liked their Key West Southernmost Wheat. This is a Belgium styled Witbeer and for spices, it was brewed with two types of orange peel and Key Limes. The wheat and lime are prevalent in the nose and transition nicely to the mouth with the lime in full display at the tail. This is a complex beer, may not be preferable to some, but I found it very refreshing at the pool. While returning from the Keys we took a slight detour to Coral Springs in order to sample the many beers produced by the Big Bear Brewing Company. 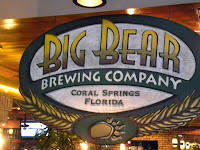 Greg Wentworth opened the brewpub almost fifteen years ago and named the facility after the dwindling Florida Black Bear population. In fact there was once 12,000 black bears living throughout Florida; but now the 1,500 remaining black bears are isolated in remote pockets. By using the Florida Black Bear as a mascot, the Big Bear Brewing Company hopes to raise awareness to this threatened animal. During our visit we sampled seven brews, five standard beers and two seasonal. We dined outside so the samples warmed nicely to express their true aromas and flavors. The Polar Light is a golden lager and is targeted to consumers of the big brewery domestic beer market. And its quite refreshing - even marketed as "light" it had plenty of flavor - could of used this one in the Keys, would have been perfect after snorkeling. Next was the one I didn't care for, the Grizzly Red Ale. Its supposed to be an Irish Red Ale but I felt there was too much caramel and maltiness and not enough hops. It was just too sweat with no balance. 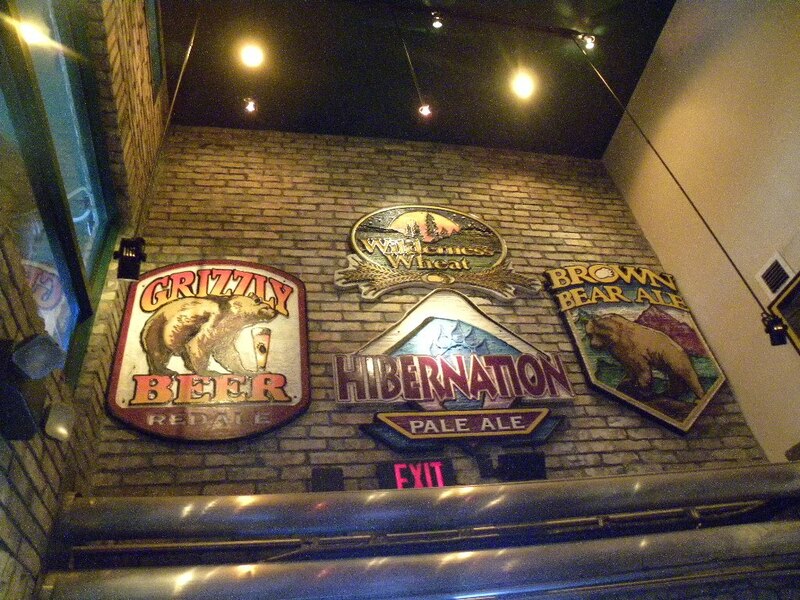 The Hibernation Pale Ale is the American Pale Ale for hop lovers. Plenty of Cascade hops here - this is a beer that pairs well with food. Very palate cleansing. Not bad. It was nice to see A Belgium style beer on the menu and the Kodiac Belgian Dubbel does not disappoint. It provides a mouthful of flavor that you expect from an Abbey Ale; to me plenty of raisins. Nicely done. 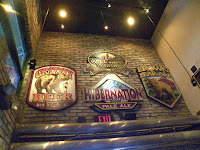 But my favorite was the Brown Bear Ale, and English style brown ale that has a nice balance between malt and hops. Its very smooth with just a hint of hops on the tail. Usually the brewery provides three seasonal beers, a seasonal fruit ale, a seasonal dark, and a seasonal brew - which was not available for our visit. The seasonal fruit was a Peach Ale which displayed a nice peach aroma, but the peach didn't overwhelm the palate. There is no doubt on a future visit that I would swallow my "manly" pride and order this beer - its good. But the real "manly" beer was the Mocha Stout, a silky smooth milk chocolate styled stout. Even with a 90+ degree day, this beer went down quickly and easily. Nice. Not only will these beers entice us to return, but the food was just as good. No fried pub food here - expect gourmet offerings, many using organic produce. The Turkey Meatloaf was awesome. 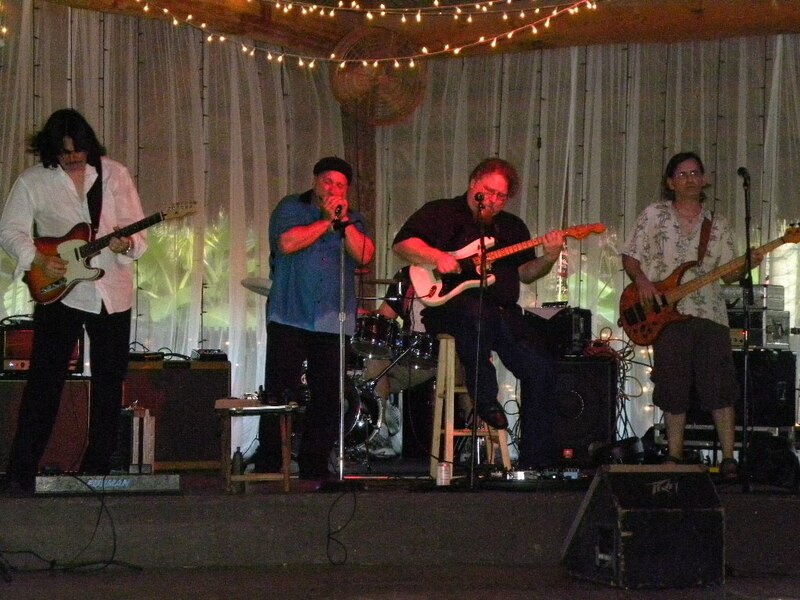 While planning a trip to the Keys, we noticed that one of our favorite south Florida blues bands, IKO-IKO, was scheduled at America's southernmost continental winery, Schnebly Redland's Winery. And with this being the only true opportunity to "drink local", we based our first day around visiting the winery. 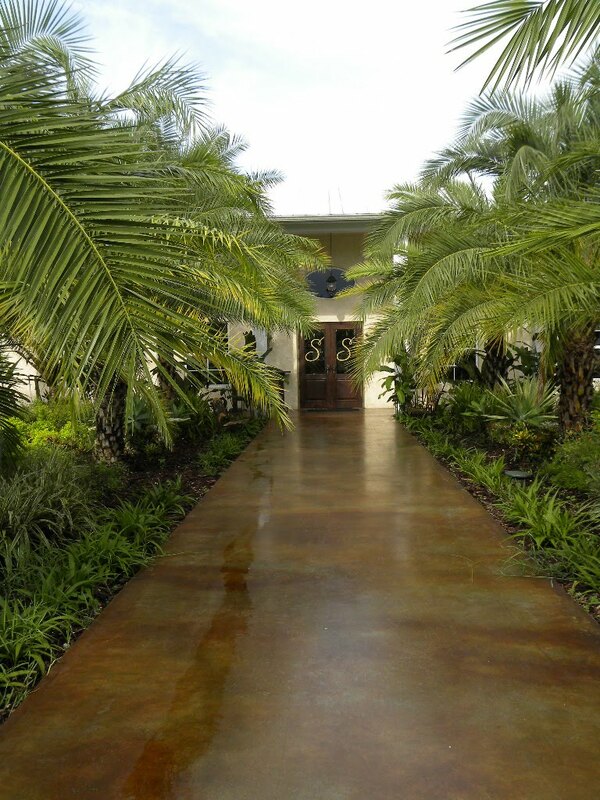 Located so far south, the winery owners, Peter and Denisse Schnebly, could have decided to source grapes from northern Florida or other states, but instead chose to make wines from tropical fruits which excel in the hot, humid environment. And why not; the same holds for vineyards in other environments - only grow grapes suitable for that region. Plus Schebley's supports the local Redland area by purchasing all fruit within a four mile radius. Arriving at the winery, we were greeted by an impressive structure. The tasting room and grounds are surrounded by coral stone blocks and thatch roofs, enclosing the facility in a tropical village. Entering the grounds visitors pass an initial koi pond and then to a large covered pavilion. 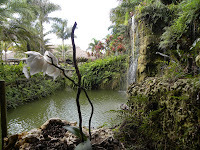 The band and early partiers were setting up shop as walked past heading straight for the waterfall and larger pond. Bring plenty of quarters if you want to feed the hundreds of fish waiting below. And walk along the elevated walkway to the back hut for another view of the fish. A very impressive landscaping feet. 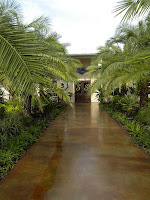 We finally entered the tasting room, which itself, is a large structure with a central circular tasting bar, boxes of wine ready to be purchased, and a nice video area of the Redland community. 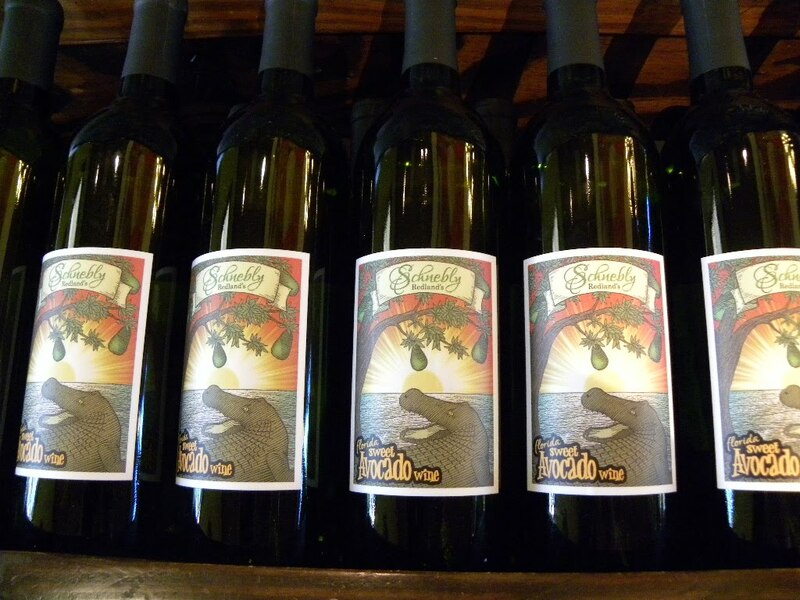 Basically, Schnebly Redland's Winery is geared for the consumer to stay put while visiting; and why not, not only is it an awesome setting, but since its so remote - why leave anytime soon. The winery charges different tasting fees, $6.95 for 5 wines; $9.95 for all, and $7.95 for the sparkling and desert selections. Look for local coupons to help alleviate these fees. As mentioned earlier the wines are made from non-traditional fruits - guava, passion fruit, mango, lychee, carambola (star fruit), and avocado. Yes, avocado - apparently their was a field that was too overripe for resale, so they gave tested their ability to make wine out of the fruit. In fact they make three versions, dry, semi-dry, and sweet. And quite frankly, they are not that bad at all, I still feel the need for a salt shaker whenever I sip - but not bad. One of my favorites was the Carambola Oak, where their starfruit wine is aged 6 months with French oak chips. This process gives a much fuller profile than their regular Carambola which didn't have enough flavor for my taste. Their most popular wines are the sweeter varietals, but none of these were syrupy sweet or gritty. 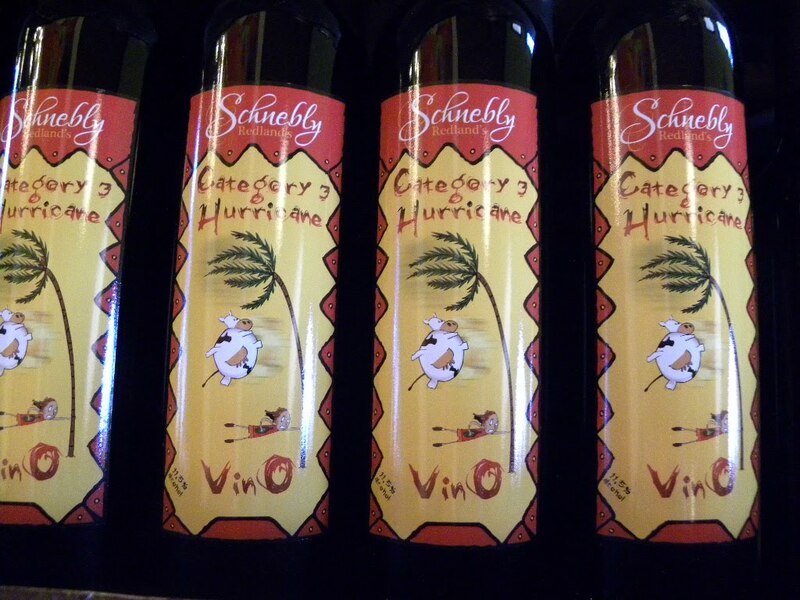 In fact, their best seller, the Cat 3 Hurricane, a blend of Carambola, Lychee, and Guava, is actually a refreshing wine. The Mango was another I liked; the Guava and Passion Fruit I thought different, but not disagreeable; but interestingly the Lychee is their most awarded wine; but I didn't care much for it. 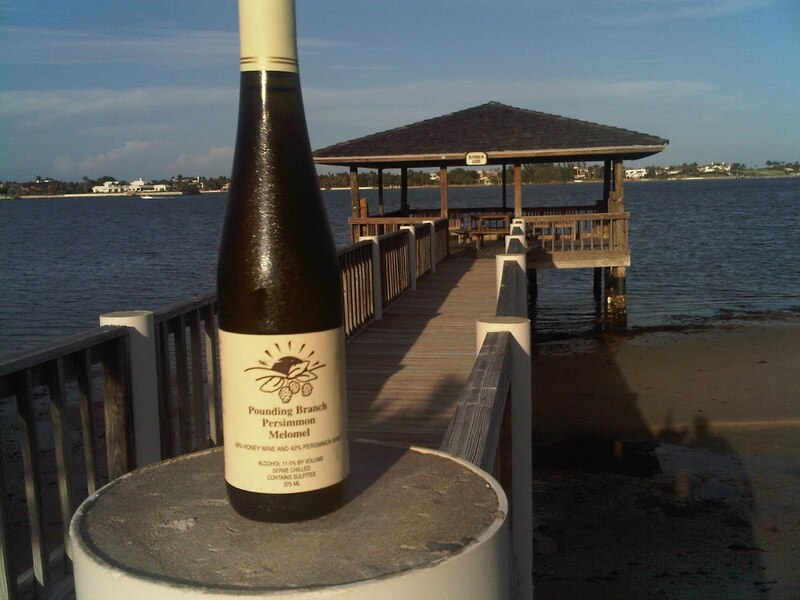 Shows that everyone has different tastes and opinions - so don't trust mine - go sample some local south Florida wine. Plus I didn't even get into their dessert and sparkling portfolio. And checkout their weekend music schedule. IKO-IKO is a rocking swamp blues band. While in Florida, I've been drinking beer and rum over wine, with anything from Brewery Ommegang, Kalik, Presidente, Żywiec, PBR, and Schlitz, and even some Narragansett Beer at Boston’s on the Beach. 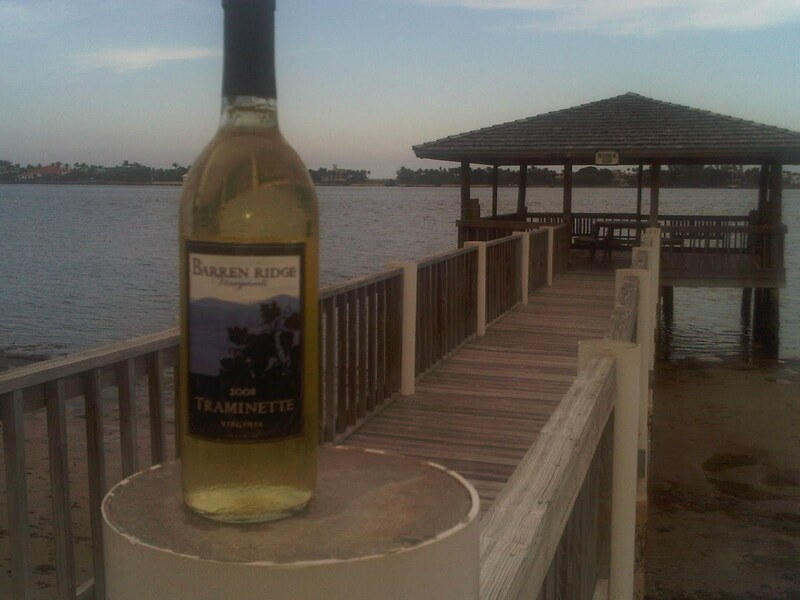 But the one wine that I was happy to bring with me was the Barren Ridge Vineyards Traminette. I picked up this wine while visiting the winery on the drive down. And it works well in the Florida heat. Its off-dry at 1% RS and has a lemon-grapefruit flavor that fits the climate. We drank it while having a picnic at the pool - perfect choice. Virginia Norton, here we come (are you there?) . . . . . .
A couple of years ago we had the opportunity to visit eight Virginia Norton vineyards. It was time to return to as many of the remaining twenty-two Norton vineyards as possible to explore this great potential experience. Thanks go out to http://www.wine-compass.com for help in navigating the hills and dales needed to find these east coast Norton wineries. On our first trip we began a Norton wine exploration by visiting Abingdon Vineyard & Winery, Bluemont Vineyards, Burnley Vineyards, Cooper Vineyards, Horton Vineyards, Keswick Vineyards, Rockbridge Vineyards, and The Winery at La Grange vineyards. We were particularly fond of the Norton wines found on that trip at Abingdon, Horton, Rockbridge and especially Cooper Vineyards. Some were better than others in 2008, but just like the grape in the fields, each year has new winners and sometimes, disappointments. Vintages vary within the course of nature’s flow and vintners’ intentions. It was time for us to return and see the changes and new approaches to Virginia’s Norton offerings. In most vineyards we were served newly opened bottles making evaluation difficult of Norton wines needing to breathe extensively before enjoying. Also some tastings started as early as 10:00 am and others were enjoyed after a long day’s drive in the late evening. Many factors could have influenced our tasting reactions, but in the end we hope this will whet your appetite for visiting the following wineries and letting us know your reactions. We started our most resent trip to Virginia visiting Peaks of Otter Winery and Orchards near the Blue Ridge Parkway. Upon finding the orchard, $3.00 can provide you with a small tasting glass which you can keep, or you can opt out for a free tasting using one of Peak’s little plastic dental sippy spit cups. Makes no difference what your preference, the tasting will be so small that only the bottom of the glass/sippy cup will be coated with the pour. The tasting sheet consists of a Mountain Sunrise Norton, a Sheep Creek Ruby Cab Franc and a plethora of Peach, Fig, Apple, Crabapple, Acia-apple, Tomato-apple, Blackberry, Pear, Plum, Mango, Blueberry, Strawberry, and Raspberry fruit bomb wines. 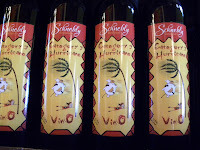 If that is not enough fruits, how about trying their 30 variety peppers Kiss the Devil chili pepper wine. Some will really like these sweet fruit wines in wonderful variations of bottle designs and colors. As for their Norton wine, my wife thought it potable without sourness, but I thought the flavors were very acidic. Trust my wife or just go with my negative flow. Let’s come away with a positive note. Their Apple wine reminded us of a once purchased sweet “Cloudberry” wine. What’s easier for you, traveling to Virginia’s POW for apple wine or Newfoundland for Cloudberry wine? Next was an evening run to Lexington Valley Vineyard. Here we found a delightful couple who returned east for “retirement” after working professionally in Missouri. You can call it retirement, but what we observed was a lot of hard work. With chemistry Professor Kelvin Hale and his wife, Janette, a real project is on tap working with grapes in the harsh environs of Lexington, VA. Not only will you find a delightful Chill Norton Rose, but a Southern treat white Traminette which had rhubarb overtones (yum). As for their Norton wines, they offered a 2006 Norton blend with 20% Cabernet Sauvignon. Good, but I found this silver award winner tainted with dark tar flavors. Their 100% Black Tie Norton is a younger 2007 murky brown wine which hasn’t matured into formal attire at this point. We picked up a couple bottles of their Norton wines for a later 2014 Virginia Norton wine comparison.
. . . . . . . . . ~ Driving along Virginia’s Northern Neck river coastal waterways a few days later, we found blue crab freshly steamed in heavily seasoned river brine. We instinctively went for our Lexington Valley Vineyard young with sharp tannins Norton and were pleased with the pairing of this wine and the incredible treat of spicy crabs. Good for this meal, but unfortunately the Black Tie Norton did not hold up the next day exhibiting cooked raisin flavors and unusually heavy sediments. Finding Virginia’s oldest continuously operating vineyard, Mountain Cove Vineyards, was only part of the allure. Here we were greeted with not only a nice “folk” Norton blend (Norton, Chambourcin, Cab Franc), but wines made from fruit that was actually fun to taste. This is a place with charm that only a backwoods setting could conjure. Enjoy the wines, but as important, ~ enjoy the people you will meet here. Bring yourself a picnic lunch and find your own special spot to enjoy the day on the farm. New Kent Winery is a new-fangled venture of homes, golf courses, soon-to-be built 5-star hotel and the like. Be aware that the $10 tasting fee does not apply to purchases. Hot looking facility using recycled woods from eras gone by, but unfortunately real cool taste reactions by us for all seven wines served. We found a brassy Chardonnay and reds that just missed the mark all together. The experience was as artificial as the Richmond, VA stamped heavy ceiling beams which had come from Connecticut. We had to buy their White Norton in the blind since they only had a few bottles left from an earlier vintage. Because of crop failure, another similar Norton will not be available until 2012. First of all, we tend to not find ourselves drinking Rose very often, but were willing to try the NKW White Norton. To make this more palatable, we tried to couple this with an appropriate occasion food pairing. Out came the freshly picked strawberries dipped in chocolate and smiles from dinner guest who finished the first bottle of NKW White Norton in quick order. Good experience and glad we made the effort to pick up bottles of NKW White Norton for this once in a lifetime experience. Until the next NKW White Norton will be available, they are substituting a White Merlot. We were fortunate in finding the owner and vintner of Belle Mount Vineyards after our late arrival to his winery along the Chesapeake Bay Region. Obviously a big investment had gone into his vineyard venture which included recreational sites, camping area, permanent RV properties, and large banquet lodge facility. Unfortunately they had run out of Norton wine in the tasting room, but he knew of possibly one bottle left in town (which we picked up the next day). He did have a Merlot, Chambourcin, Norton blend created for the 40th anniversary of the Virginia is for Lovers tourism campaign which we found a bit tart and musty. Our host so overwhelmed us with the politics of Virginia wine laws, we were not able to focus on his wine offerings. His over confidence in his wines punched out at us, making it impossible to reflect on them. Returning home we gave this Norton wine time to settle from our travels. We uncorked the bottle and let it breathe for 40 minutes or so. During our pouring, we noticed the term “inky black” certainly applied to this Norton wine - the blackest wine I’ve encountered. This wine had a slight murky aroma and a taste that had minimal sour overtones with very little tannin interference. I had to close my eyes in tasting this wine because the color tainted my opinions. Not a bad Norton wine, but you will have to just take my word for this since he is completely sold out now of this undated Norton wine vintage. He did not give me a date of when he expected to bottle his next Norton grape harvest. Driving along the Northern Neck peninsula of Virginia between the Rappahannock and Potomac River we arrived at Potomac Point Winery. This is a great setting for a presentation of wines. Their well scripted wine list included wine name, pictured labels, appellation (Virginia vineyard locations), varietal make up of each wine, aging (SS, French & American Oak), alcohol percentage, residual sugars, winemaker tasting notes, cost, and space for your own tasting notes. Wow, we wish other wineries would mimic this wine list layout. At Potomac Point Winery you get a choice of Classic or Reserve tastings ($5 / $10) which was suppose to include the cost of your glass, but alas they had run low on stemware and did not offer a discount or bottle applicable pricing for their retention of the advertised glasses. Lots to choose from, but again we were here for their Norton wine. An unusual cocoa bouquet 2008 wine made from Orange county grapes (leased land near Horton Vineyards) which I was not immediately enamored with, but will put up for a few years and try again in 2013 or later. Though I did not personally visit Barrel Oak Winery along I-66, a short ride west of Washington, DC, my daughters were there and reported a beautiful new facility “packed house” that was noisy and incredibly hard to get service. It took them literally 20 minutes to buy us a gift case of Barrel Oak Winery 2009 Nortons, an Indy International Red Wine of the Year winner. They are usually pretty insightful about what we would enjoy or not, so we did not go to this vineyard. We did try the BOW Norton wine and decided that the wine would be greatly enhanced with a few years of resting quietly. Sometimes you just get lucky when finding a small remote vineyard and this was the case at Castle Gruen Vineyards And Winery and its owner-vintner, Dean Gruenburg. 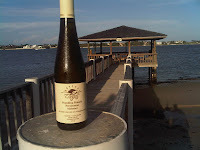 We made a concerted effort to find this setting through recommendations made by several Virginia Internet wine bloggers. Usually only open on weekends, Dean was very gracious in meeting us one early weekday. Though only five offered wines from this small family vineyard, you are quickly introduced to a person who is truly in love with his grape works. You just cannot go wrong with any wines at Castle Gruen. From a truly well crafted “Southern” Gewurztraminer style Traminette produced in stainless steel to a drinkable now Merlot (75% Merlot, 10% Alicante Bouschet, 10% Concord, 5% Viognier). His CGVW 2007 Norton is described as ‘Deep, Dark, Vanilla, and Cherry, with Balanced Tannins’. Good description except we did not find this Norton “dark” in color or taste. Dean stated that “the issue is not always the flavors, but the aromas” and this is so true to the bouquet of his light bodied, yet complex California Pinot Noir style produced Norton wine. Sixteen vineyards later on this one trip, my wife found this the most drinkable now Norton, but we both are betting after holding for a few more years we might have one of the best Nortons to be found in Virginia. Don’t leave without considering also their King’s Red blend (Merlot-Cabernet Sauvignon-Cabernet Franc). Again, we will hold this wine royalty for a few more years. Dean’s experimentation with wine started at the age of eight (yes, 8) and today he is still looking forward to the latest and different with new grapes coming on line; as, Crimson Red in approximately three years. Thank you Castle Gruen for your time and pleasant wine and visit. We are betting that DuCard Vineyards will become a Virginia Wines point-of-interest for many wine travelers in the years to come, tucked neatly in a scenic roads Shenandoah mountains valley 45 minutes off I-81. Though only a few offerings at this time selling out very quickly each year, we were so lucky to hook up with Scott Elliff in his busy schedule as he works to finish the new on-site tasting and sales facility scheduled to open in late May, 2010. How wonderful it was having him showing us variations of vine pruning in his vineyards. The ride into the beautiful Madison County area is a memorable part of the journey, followed by a superb drink now or hold 2007 Norton. DuCard’s description lists this wine as an ‘intense and inky-black wine with distinctive aromas’. This wording accurately describes a wonderful, newly discovered, Norton wine. Unique to this vineyard is Scott Elliff’s participation with a nearby technical college in which students “adopt” a row of grapes. What an experience he is presenting with his community viticulture teaching and work participation program. Wisteria Farm and Vineyard: It has been noted that California often tries to recreate the European wine experience. In the town of Stanley, VA we found a lovely setting and charming Lebanese host doing the unusual in not duplicating someone’s wine, but rather creating his own unique style of wines, including our native Norton. Mousa has introduced to his small community a wealth of wines including Traminette, Seyval, Chardonnay, Viognier, Merlot, Norton, and in the future a Lebanese grape. This young Norton is not polished at this time, so we will hold our purchase for a few years to see what develops. A flier from Rappahannock Cellars states: “Recognizing the promise in Virginia wines, we moved our family’s winery from California to the Blue Ridge Mountains in the heart of Virginia.” And with this move came the knowledge for preparing a wonderful assortment of wines produced from local Virginia grapes. Usually sticking mainly to Norton wines, we left Rappahannock with a case containing Claret, Meritage, Nortons, and a Port styled 100% Norton dessert wine. Some delightful white wines were available, but alas our case could only hold 12 bottles of reds and my wife had to lug the tote bag out with the four ports. The Norton was a 25% Cab Sauv blend which made this an easy to drink now Norton, but will be enhanced by putting away for a few years. Interestingly discounts applied only to Club Members, but a “Spring Special” applied to others in forms of free tasting fees / extra bottle (3 bottle purchase 1 free tasting; 4 bottle purchase 2 free tastings; & 12 bottle purchase 2 free wine tastings plus 1 extra bottle of your choice, ~ a Vintner’s Dozen). High praises go to Rappahannock Cellars for another reason, and that being their willingness to share facilities and insights with new area vintners. We visited several Virginia wineries freely stating their appreciation for all the help given to them by this Front Royal, VA area site. In Casanel Vineyards we found a relative newcomer to the Norton world. What a pleasant setting using original structures dating back into the 1700s. The tasting room had been a small rock barn in which the proprietors had carefully recreated proudly the structure into an inviting venue for sharing wine with others. There is a sense of great pride with every project on the grounds. With the maturing of vineyard vines in the years to come, this location will become popular to visit and relax with Casanel’s wines. Though not to our taste, Casanel’s Rose Norton Batucada is a wine that I think would be perfect for preparing sangrias. You can already find here Chardonnay, Viognier, the mentioned Norton, Merlot, and a Cabernet. A $5 tasting fee does not apply to purchases. Good things will be coming from this family endeavor. Dry Mill Vineyards & Winery is only a short drive from Casanel Vineyards. Basically the same location, but oh so different are the wines. You meet the proprietor, Dean Vanhuss, and you know that you are going to enjoy some of his wines. All wines are purposely different with an appreciated attitude. Take his spicy (my wife said “salty”) flavored Traminette which contrasts to previous tastings of this grape, but again unique to the fruit. The same can be said for his light, yet tasty Chambourcin. The attitude carries well over into his Nortons combined with 10% Mourvedre for this softened blend. Though Dry Mill’s 2007 Norton can be easily consumed now, we are going to put it through its paces for a couple more years and enjoy at a later date. 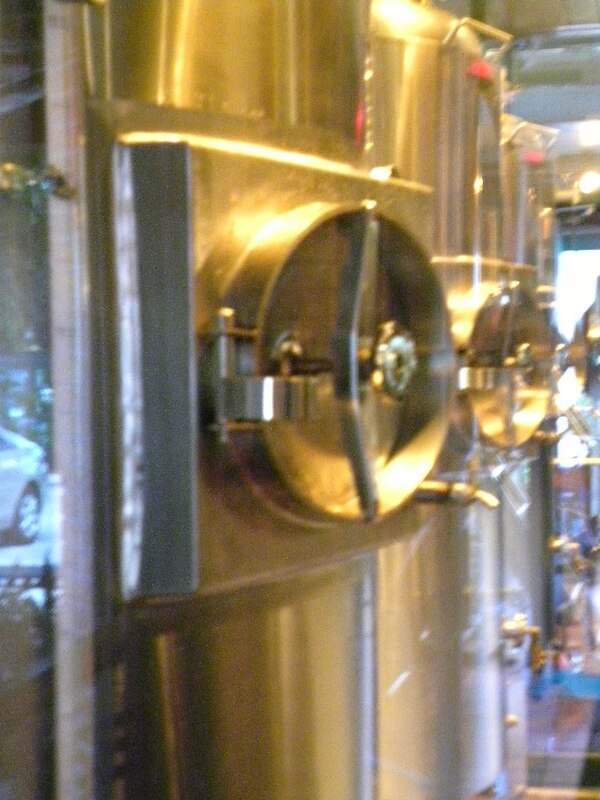 It is refreshing at this site to compare Chardonnay wines prepared in stainless steel and with one oak barreled. What fun, it’s your choice. We found generally Virginia’s gravel roads lead to good wineries, but add a single lane bridge into the picture and you get even finer wines. With this description your travels take you to Chrysalis Vineyards. Here you have a choice of a $5 Estate tasting or a $10 Reserve tasting. Let me implore you to treat yourself to the $10 Reserve tasting. As you ramble through the offerings, the variety and quality will soon be apparent for the additional pricing. I’m not a fan of tasting fees since I find so many good wineries do not need these, but there are those locations that possibly protect themselves from abusive curiosity wine seekers. In the case of Chrysalis Vineyards, you will get a more than reasonable taste and “seconds” are not turned down if requested in a polite and thoughtful manner for a particular reason. 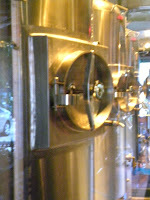 Here you will be treated to an array of non-viniferous wines broaching all that can be found well in Virginia. With the Reserve tasting, if you buy them or not, you will have experienced some of the best Norton wines that can be found on the East coast. What you experience two years ago will change today and two years from now since Chrysalis dramatically changes their blends annually. If you want to really learn more about the American wine industry which includes a fabled history of the Norton grape, search out the new book by Todd Kliman, The Wild Vine. This is a documentary about the characters, dead or alive, and the development of the American wine world, including the contributions of Chrysalis Vineyards and Jennifer McCloud. Learn the importance of wineries; as Chrysalis Vineyards in Virginia or Stone Hill Winery in Missouri, to the true development of a continuing story of American wines, - yesterday, today, and for sure, tomorrow. Trying to catch Paradise Springs Winery open means making sure that you allocate time during your weekends for a visit. The ride through the elegant Clifton, VA home roadways will be rewarded by finding their small log cabin winery tasting room built in the early 1800s. Maybe as important as the wines you will encounter, is the story of bringing PSW to fruitation. A complex venture evolved to offer the community that PSW serves wines of amazing substance within the first year of its public operation. Grapes are brought in from other Virginia vineyards at this time, but with the gracious help of nearby wineries, Jane Kincheloe Wiles is producing wines quite successfully. Not only does her 2008 Norton, which is aged only six months in Hungarian oak, stand up well to established VA wineries, this wine took a 2010 Governor’s Cup Gold Medal. For me, I was equally impressed with their 2008 Cabernet Franc. Can you imagine Cab Franc as a soft tasting table wine with interesting character? 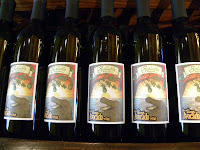 Do yourself a favor, travel out to Paradise Springs Winery and enjoy a wonderful glass of wine. Veramar Vineyards is a beautiful 100 acre setting surrounded by the Shenandoah hills where 5,000 gallons of wine are produced annually. There are 12 acres of vines at this site with other winery vine locations scattered nearby. A $5 tasting fee is charged, but dropped with purchases. Though nine wine selections are listed, be aware that their $50 Estate Norton is not offered for tasting and only available to Veramar Estate Club members (can you believe there is a Virginia Norton deserving this price?). Another thing that irked me a bit was that Reserve wines can only be tasted and purchased on weekends. I found it amusing that half of the wines had descriptions of pineapple or grapefruit. Sounded like we were getting ourselves into a fruit bar. Interesting was VV’s production of a 100% Mourvedre. We enjoyed the opportunity to try this Virginia grown Spanish wine, but left with only their Riesling/Vidal white and for a friend a Rooster Red blend (Cab Sauv, Cab Franc, Merlot). We are still curious about the almost non-purchasable $50 Norton one is not able to taste. If it follows in taste as the other rather middle-of-the-road Veramar offerings, we know that there are other good Virginia Nortons to be had (thank you Cooper, Chrysalis, DuCard, Castle Gruen, Rappahannock, Paradise, etc.). Hmmm, I wonder if I know someone who can help me on this tasting note at a later date? Has anyone else noticed at this location how many negative signs are posted around the grounds (Harley Parking Only, No Parking, Employees Only, Authorized Personnel Only, Private, Foods Only Purchased Here to be Consumed)? 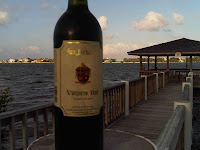 - From Brian at The Other 46 blog comes the following about Veramar’s 2007 Norton: Retailing for $50, I wasn’t sure what to expect, as this was easily the most expensive wine I’ve tried from Virginia. Unfortunately, I was underwhelmed. A solid wine with nice black fruit and oak, the wine is far, far from a $50 wine. But then again, everyone’s palate is different, and I’m sure they sell the heck out of it. After visiting Virginia vineyard farm settings that have been in the family for over 200 years, other winery acreage that have developed over the last 15-to-20 years, and wine locations built recently with millions of speculative dollars, it was fun finding a winery that measures how many pounds of grapes were accumulated from the number of vines rather than from how many acres (as little as one vine and as many as five) in his backyard. Welcome to MistyRay Winery in Phillip Kreider’s Harrisonburg, VA suburban back yard. Here is a hobby gone wild from a man who grew up with grapes on his boyhood Ohio farm. Grapes have always been a part of his life, and though alcohol was not condoned in his youth, he learned to appreciate the production of quality wines during his life’s work and travels. At this home backyard setting, Phillip has been amazing to plant over twenty-five unique grape varieties for his desired extremely limited creations; as, Chardonel, Arkansas Sunbelt hybrids, and of course Norton grapes. Each wine offered has a different shining quartz-soil story to tell. Few Virginia vintners can produce a tasty Cabernet Sauvignon, but Phillip can. 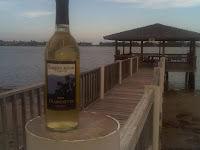 Don’t pass up his light yet complex flavored Norton wine that truly can stand up to most Nortons produced in Virginia. Since he gets 10-to-15 pounds of Norton grapes per vine (75 lbs total last year), you still have to be quick in being able to purchase this limited production wine. You hear at other vineyards how their wines are produced in stainless steel or oak barrels, but here you taste wines produced in genuine American glass. Do yourself a favor and call for an appointment to visit Misty Ray Vineyards, and don’t forget to ask to taste his rhubarb wine. We did not make it to Valhalla Vineyards, Byrd Cellars, Bright Meadows Farm Vineyard & Winery, Molliver Vineyards and Hummel Vineyards, so we have something to look forward to in the near future. A fun eight days finding seventeen Norton grape wineries, plus others that had been highly recommended to us: Lovingston Winery (great 2007 Cabernet Frank and Reserve 2006 Merlot), Corcoran Vineyards (trust me, too many good things to say about this winery, ~ grand red wines), and Fabbioli Cellars (What Doug Fabbioli does with Virginia grapes boarders on the magical. Two exceptional Virginia wines can be found in their Chambourcin and Reserve Cabernet Franc). Now it’s your turn to make comments on the vineyards I’ve listed or criticize what we found. I look forward to learning from you what takes you have on Virginia’s Norton offerings. Since Norton grapes acquire its own wine characteristics not found in other viniferous wines, this truly entails developed tastes that can be interpreted in so many fashions. Thank you for letting me share our personal experiences and we look forward to hearing more on what you have found in the world of Norton wines. And remember, as you read Todd Kliman’s The Wild Vine, have your selected Norton wine at hand that has had the opportunity to breathe for at least 30 minutes. I'll finally got a chance to drink local based on various definitions by opening a bottle of San Sebastian Winery Vintner's Red. I think we had picked up the bottle the least trip to St. Augustine and as I recall I generally prefer the Vintner's White over the Red. However, the red was all we had. And it is what it is; a slightly sweet muscadine wine made from the Noble grape. And served slightly chilled, it works in the south Florida heat. Its full of flavor; smooth and complements a burger nicely. Tomorrow the remainder will be used as a base for Sangria. And while headed home we are stopping by to load up on some Blanc Du Bois. 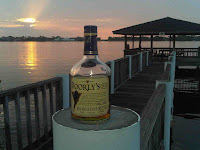 On a recent visit to the Total Wine in Boynton Beach, I was wavering between several rums until a helpful staff member recommended Doorly's XO. The rum is crafted in Barbados by the famed R.L. Seale & Co. Ltd.; the distiller is wholly Bajan-owned and is the third largest bottler in that island nation. I am familiar with the distiller after purchasing a bottle of Old Brigand during a cruise stop, while others may be familiar due to their production of St. Nicholas Abbey Rum, Tommy Bahama White Sand Rum, and the Doorly's brand. 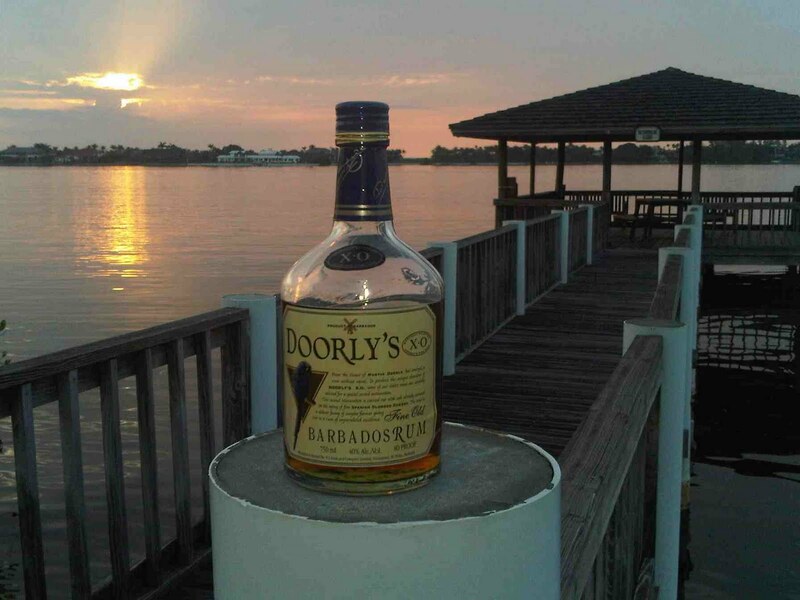 There are four products using the Doorly's name Doorly's Fine Old Barbados 5 Year Old Rum, Doorly's Fine Old Barbados Rum XO, Doorly's Light Macaw, and Doorly's Macaw Dark. According to Edward Hamilton, Ministry of Rum, Doorly's 5 yo and ginger ale with a dash of bitters is a common Bajan drink. But for our purposes, the Doorly's Fine Old Barbados Rum XO is your sipping rum. It is distilled from fermented molasses and then aged in used whisky barrels. The best rum is then selected for a second maturation in used Spanish Oloroso Sherry barrels. This second aging infuses the rum with certain flavors not found in other aged rums. While drinking neat, the rum exudes spicy aromas and a slight nutty flavor. However there is a noticeable burn on the tail that masks its finish. By merely adding a couple drops of water - the alcohol gets dampened so that the burn disappears, displaying an incredibly smooth finish. Wow. And priced at $17, this is a bargain. We prefer you select Virginia, but vote for your favored destination for the 2011 Wine Bloggers Conference. Voting closes June 10th. The 2010 Wine Bloggers Conference is being held in Walla Walla from June 25-27th.